But first I must send it out for review. Using a system that’s tired and old. Each word that you write goes straight to the heart. Alas, ‘twas just my imagination. Reviewer 2 do you have a more open mind? Reviewer three, please say something kind. Damn the reviewers to hell! I’ll just submit to a journal of lesser repute. 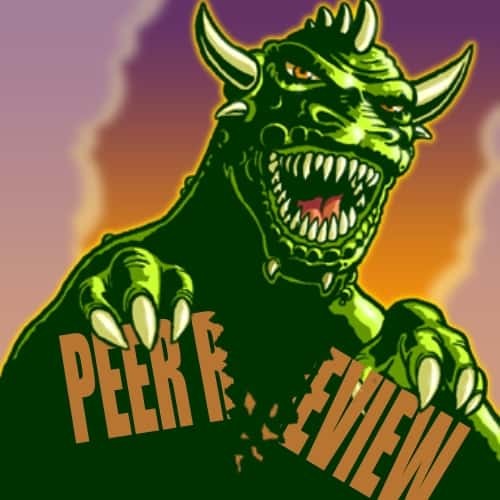 The Peer Review monster (Image Credit: Gideon Burton; CC BY-SA 2.0). Good job! Now try submitting “Peer Review” to a poetry journal. find out what it is we want you to say. so long as it’s contemporary norm. but be aware short verse is now the trend. Your work won’t be assessed. We see too much for personal reply. until months after that, or not at all. so you had better save a copy, Dear.